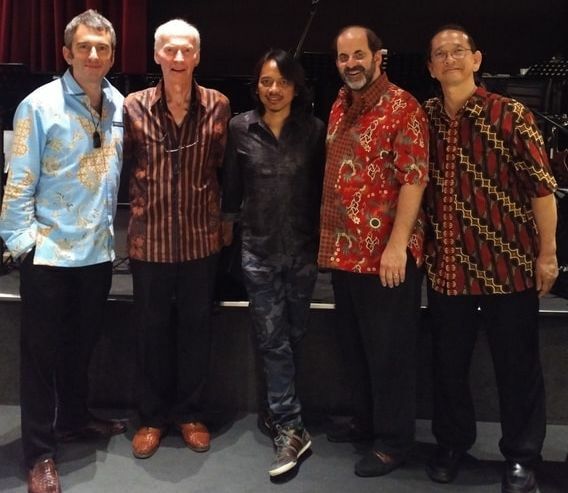 Dewa Budjana - Charged Particles: Jazz with a Spark! Though the Indonesian public may best know him as the guitarist of Gigi. Dewa Budjana already had an illustrious music career long before he helped co-found one of Indonesia's most beloved PQP rock bands in 1994. Born in Waikabubak, West Sumba on August 3, 1963. 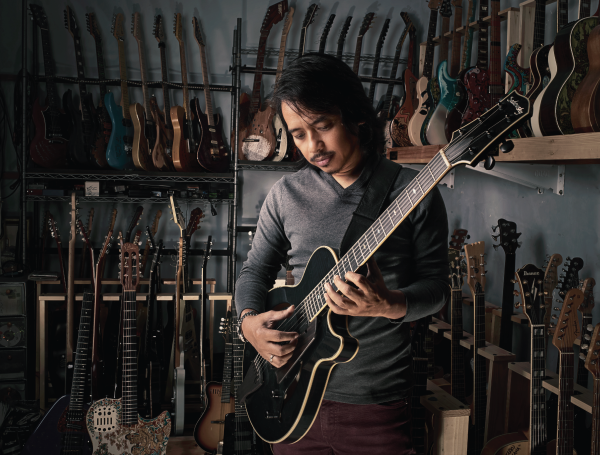 Dewa Budjana first fell in love with the guitar at the age of 11 after hearing construction workers play the instrument during breaks near his parents' house in their hometown of Klungkung. Bali. which eventually prompted him to liberate some of his grandmother's money to buy his own guitar in Denpasar. Budjana spent his formative years in Surabaya. where he absorbed an array of influences ranging from Leo Kristi and John Denver to Yes, Jeff Beck and Pat Metheny. and started his first band. Squirrel, in 1980. While other local jazz bands at the time preferred to play cover versions, Squirrel was bold enough to rely on their own compositions and won the Best Band title at the prestigious Light Music Contest in Jakarta due to Budjana's original piece. "Nusa Danlai". expansive repertoire of hits. many of which were co-written by Budjana. Despite Gigi's hectic schedule, Budjana has still managed to devote time to his solo career. Releasing six albums that showcase his flair for melding progressive rock and traditional music. His solo album Joged Kahvangan. was recorded live in Pasadena, California with drummer Peter Erskine saxophonist Bob Mintzer. bassist Jimmy Johnson, and pianist Larry Goldings. Harmony is an important principle in Budjana's musical life, from the way he balances his thriving pop rock career in Gigi with his esoteric jazz interests, to his participation as a devout practicing Hindu in music collaborations devoted to other faiths. Dewa's ambitions on his instrument extend beyond his commercial success as he has released eight solo albums, exploring his more adventurous jazz fusion/progressive side. Dewa saw his audience grow from regional to worldwide, when he joined onto the MoonJune Records label in 2012, releasing four albums to date: Dawai in Paradise, Joged Kahyangan (with Erskine, Johnson, Goldings, and Mintzer), Surya Namaskar (with Collaiuuta and Johnson), and Hasta Karma, featuring Pat Metheny Unity Group's young phenom, Ben Williams, on upright bass and the great Antonio Sanchez on drums, accompanied by veteran NYC session musician Joe Locke on vibraphone.